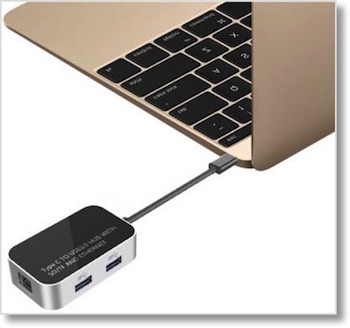 I get a lot of questions about the 12″ MacBook and specifically whether I find the one USB-C port to be limiting. For my use case it’s not a big problem but I did buy a dongle that fills in 90% of what’s missing when I do need something more. With a single USB-C port, you can’t plug in any kind of “normal” USB device. Those devices use USB-A, the rectangular, flat connector with a white insert so you have to have it right side up to plug it in. You can buy a USB-C to USB-A adapter from Apple for $19. It’s been a while since Apple has shipped a Mac notebook with an Ethernet port but there are times you’d really like to be able to plug for a faster connection. Apple sells an adapter for the Thunderbolt equipped Macs (for $29) but not for USB-C. Monoprice sells one for $18 though. I found a dongle that solves all of these problems. It’s not elegant, it’s not pretty but it does work. I picked it up on Amazon for $20 from a company called Aerb. It’s a bit on the chunky side, but it sports two USB 3.0 ports, an SD card slot, a slot for the smaller format memory cards, and gigabit Ethernet. It’s a powered USB hub but if you want to supply additional power there’s a 5V DC port on the device (power adapter not included). I said the Aerb dongle takes care of 90% of what I need on a normal basis, so I should talk about the two things it doesn’t provide for me. It doesn’t have passthrough USB-C which might be nice to allow you to also charge the MacBook while using the dongle. It isn’t a big problem because the battery life on the 12″ MacBook is fantastic, but something that would have been nice to have. I had to buy a second adapter to allow me to do presentations from my MacBook because this dongle doesn’t provide any video out options. There are so many different video out options though that if they had added one or two it would have turned into a giant beast of a dongle! You’ve got HDMI, DVI, VGA, and even Apple doesn’t include them all on the same dongle. The digital one alone costs $79. For $20 I’ve got something that lets me add USB microphones, thumb drives, external drives and my SD card from my camera and connect to wired Ethernet all at the same time, so I think it’s a great little device. Check it out on Amazon.